This bread is the result of an experiment Matt and I performed one night. 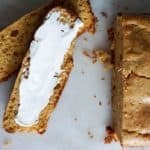 We already created an amazing keto bread using almond flour, but could it be done again with peanut flour? Well, spoiler alert – yes it can be! Peanut flour was new in our kitchen so we wanted to really give it the full attention it deserved. That meant making five different mini loaves to see how it collaborated with different ingredients. One had peanut butter, two had coco powder, three had cream cheese, four had psyllium husk and five was standard with the peanut flour standing on its own. The winner, in case it isn’t clear to you by the title, was number three, the cream cheese loaf, so naturally we had to make it into a bigger 8×4 loaf! The secret ingredient to our Cream Cheese Bread is… cream cheese! It not only keeps the bread extremely moist, but gives it a dense texture like you would get in a pound cake. It’s just the right amount of sweet and slightly tart. You can slice it up for breakfast with some butter or eat it for dessert. I’ve already made it three times in the past week and taken it to friends houses. It has passed the non-keto eater test! Trust us, this is a bread you won’t be able to stay away from once you try it. Also, we’d like to take a moment to highlight peanut flour. It’s similar to coconut flour in that it’s highly absorbent so you need less altogether. But, we would definitely recommend it over coconut flour for baking breads. By using less to make an entire loaf you are taking in fewer calories – now isn’t that worth investing in?! Using a hand mixer combine room temp or melted butter and cream cheese throughly. Add golden monk fruit, yolks, vanilla, baking powder and salt. Combine well. Finally, add the peanut flour and combine until it forms a thick batter. Pour into a greased loaf pan and bake at 350 for 25 minutes.